India, as a country is known for various things that revolve around the idea of an ideal family and one of such things is the concept of "Joint Family". The idea of staying together allows you to celebrate various things, no matter how small they are and more importantly, you always have someone or the other waiting to hear you, the feeling of being alone doesn't exist in reality, unless you intend to stay alone. You can share your problems and everyone comes up with a solution, in family there is unity, in family there is love. And as the famous saying goes, the family that eats together, stays together, you will never have to eat alone! A big yes for the foodies out there, ha! The number of "Joint family" in India may be on a constant decline and the nuclear families are growing rapidly, but somewhere in the core of the Indian family system, the essence of the Joint Family hasn't died away. 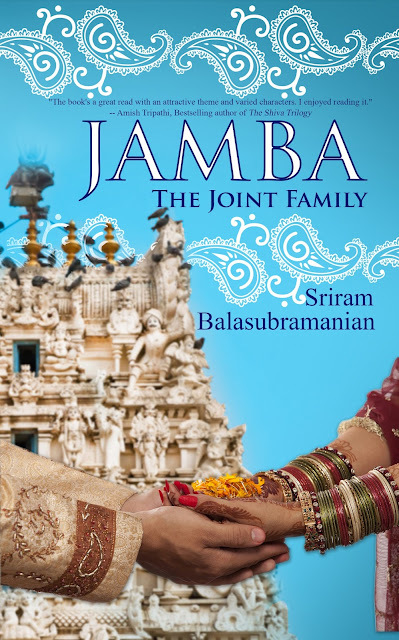 I recently read Jamba - The Joint Family, a book by author Sriram Balasubramaniam. 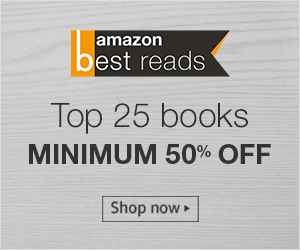 The story of the book is about an Indian Family, South Indian Family to be more categoric and a Tam-Brahm family to be precise. It revolves around the great Indian festival of get-together and unison of two families called "Marriage". Yes, marriage is no less than a festival in our country where you can see all the nuclear families coming together, and if you are already in a joint family, you are in for some great entertainment and celebration. The story is also about how individuals of different mindset constantly oppose each other and still when in complete distress are together trying to fix a problem. It is completely Indian, truly cultural and amazingly modern. The story, outright, is full of traditional Indian values, with newer takes on them and yet keeping the essence of conventional customs alive. As far as the plot of Jamba - The Joint Family is concerned, I won't write much about it as it is a very generic one! But still, the story is about Lalitha, Karthik's sister getting married to a guy with an equally traditionally family. Karthik wants to make sure that her favorite sister's marriage goes through well without any problems, but then it's a joint family with family members, read nuclear families, coming from the United State, it won't be an easy marriage. How the family, especially Karthik and the Jamba Paati take things through is what makes the story attractive. Also, what set's the story apart is the simplistic solutions, sometimes keeping the ego at bay, in the complexity of the problems. The story is also about the generation gap in terms of thoughts, thinking process and the liberty, the choice of words and the narration makes it very realistic and acceptable. The characters of Jamba - The Joint Family, young and elderly, are very relatable and interesting too. Jamba Paati, one of the most elderly characters is intriguing and will make you wish that your grandmothers were like her in terms of her thoughts, her kindness, her understanding and her ability to sense, access and solve the problems even before you get into them with spontaneous tailor made solutions. She takes everyone by surprise with her sheer ability to express and being informed of the situations while others are in the "panic" mode. The only thing that I personally didn't like was the usage of Tamil words every now and then, though there was an English translation of the same, it became difficult to be with the flow of the narration. However, I did learn a few Tamil words, which I guess, the author intended to do. If you are an Indian, you can easily relate to the story because you know why. I would recommend this book to anyone who is interested in reading something that is emotional, interesting, relatable and fun at the same time. This Review is a part of the Blogger Outreach Program by b00k r3vi3w Tours. Seems like a very Sanskari story, lol..
Haha! But Alok Nath isn't a part of it. Jokes apart, it is a good read.